The sealed line includes threaded type filters for application in internal combustion engines for oil filtration, fuel filtration and water or coolant filtration; these filters are characterized by being constituted or formed by a jar, a filter element formed by paper, the central tube, an upper or lower cap, a pressure component and some of relief valve, a disc ring which exerts the seal of the filter and contains the thread to be incorporated into the filtration system of each vehicle. From the sealed we have products with the highest efficiency and with the best quality and innovation standards for gasoline and diesel equipment. 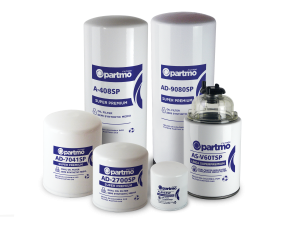 References are Super Premium Line and the new Partmo Plus Line.